This patient's front tooth required extraction. The tooth was beyond saving. 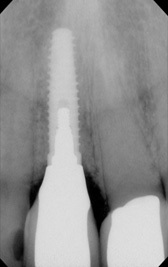 Inflammation from the fractured root and failing root canal are evident in this before photo. Cavities were present on the adjacent teeth. 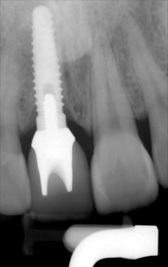 An immediate implant was the best solution. 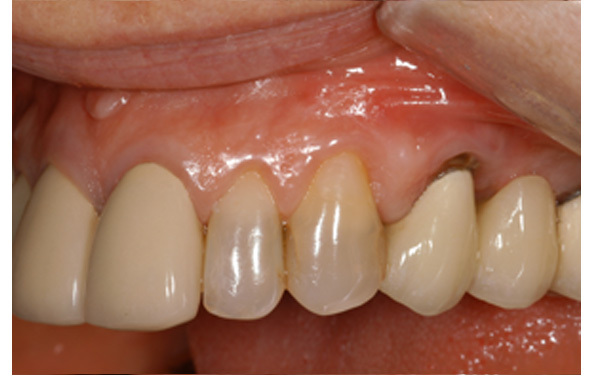 At the time of extraction, an implant, abutment and temporary crown were placed. 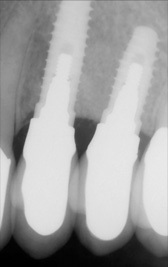 After healing, a zirconium abutment was made for the implant, and porcelain crowns were attached. 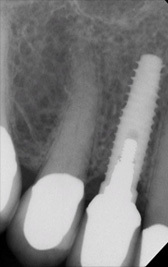 Our patient was thrilled with the natural appearance and the convenience of immediate implant placement. This patient was born with a congenital abnormality called amelogenesis imperfecta. This condition is characterized by small teeth with poorly formed enamel that are prone to sensitivity, wear and cavities. 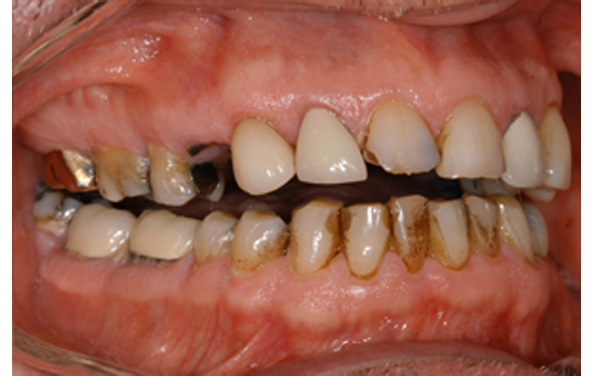 We placed temporary restorations on all his teeth and referred him to an orthodontist for better alignment. Following orthodontic treatment, our patient returned to our office for restorative care. 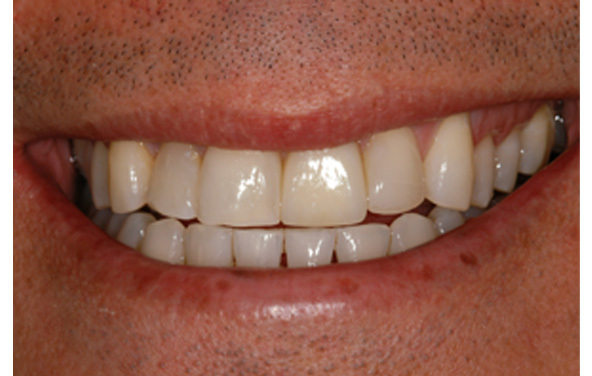 We replaced a hopeless front tooth with a dental implant and replaced his temporary crowns with permanent porcelain crowns. Once the procedures were completed, our patient looked like he was simply born with a perfect smile. 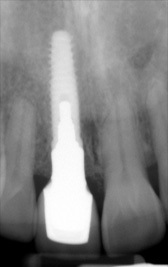 This patient came to us desperately needing help with an incorrectly placed and failed implant. 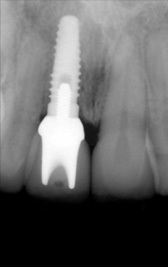 A new implant and crown solved the problem. 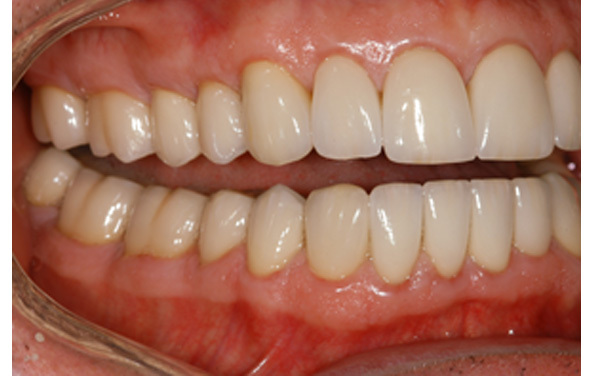 The patient was relieved to have a gorgeous smile once again. 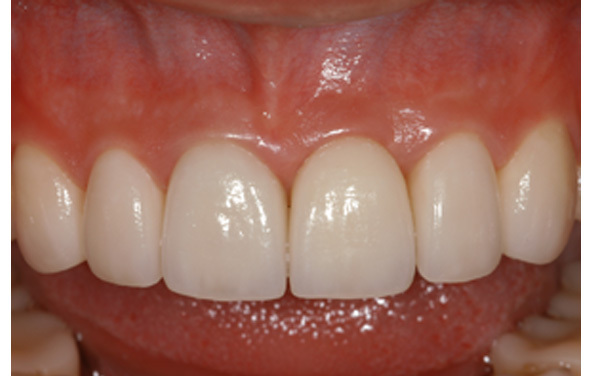 This patient was congenitally missing both upper lateral incisors, a condition that typically develops a crooked smile. Braces were necessary to straighten her smile. Following orthodontic treatment, her orthodontist referred her to our office for restoration. 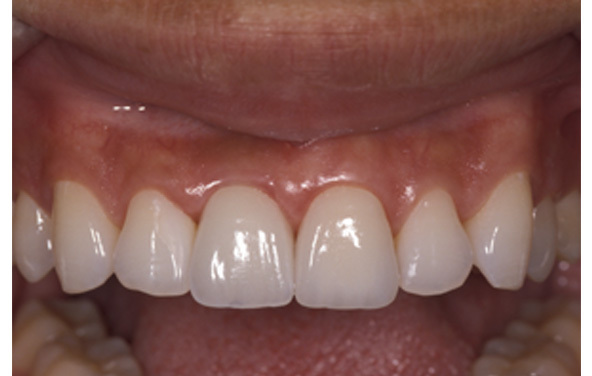 We placed dental implants in both lateral incisor positions. Gum grafting was also accomplished to make the gum tissues more even and symmetrical. 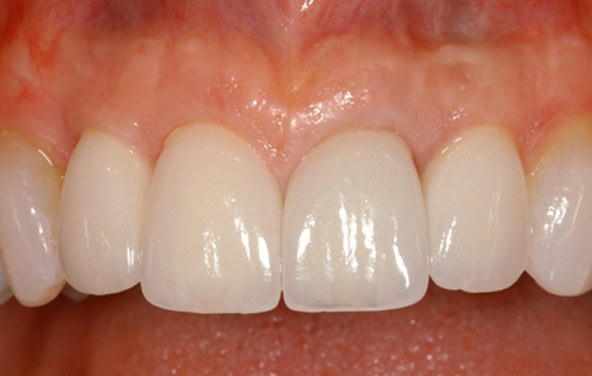 Finally, porcelain crowns were placed on both implants and her two front teeth. 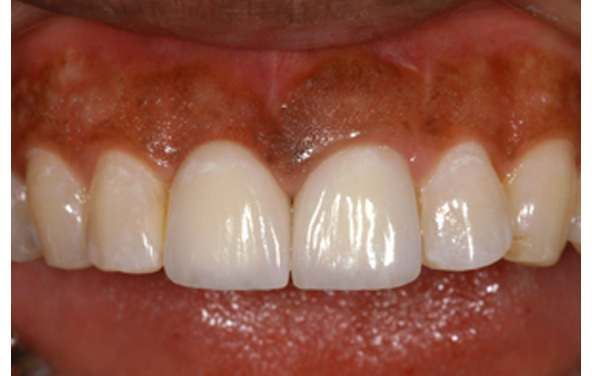 Our patient was excited to finally have the smile that she always wanted. 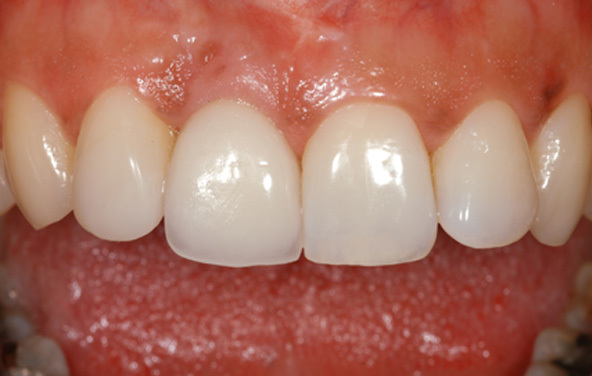 This patient came to our office with his crown in his hand and hoped that it could be simply re-cemented. An examination revealed that the tooth root was split in half and could not be salvaged. 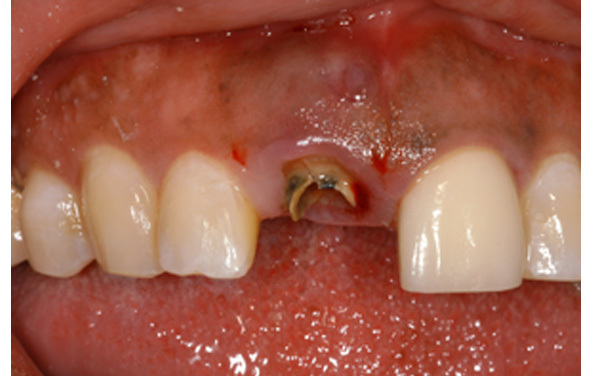 A course of antibiotics was necessary to treat an infection caused by the fractured tooth. Following extraction of the tooth, an implant was placed, and a bone graft replaced bone lost from the infection. 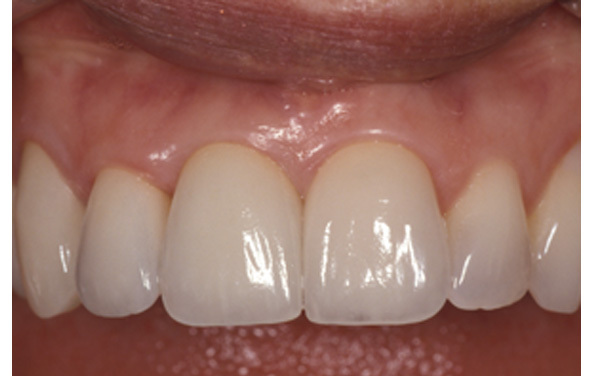 Finally, crowns were placed on the implant and the adjacent front tooth. Our patient is happy that they look, feel and function naturally. 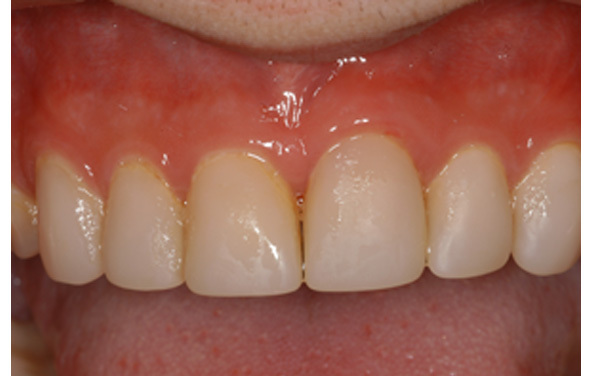 This patient was congenitally missing one lateral incisor. Her orthodontist straightened her teeth and referred her to our office for restoration. 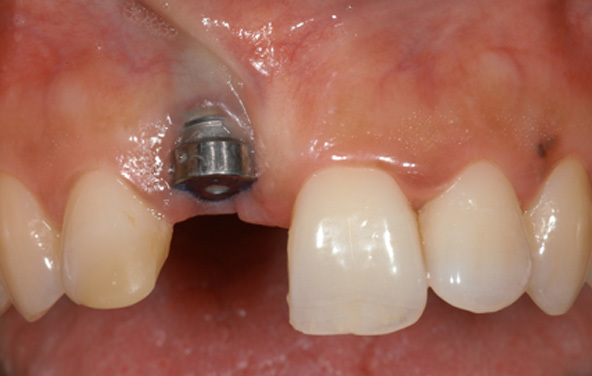 A titanium dental implant was used to replace the missing tooth. The other option, a dental bridge, would have been inappropriate because it would have required grinding her adjacent teeth. 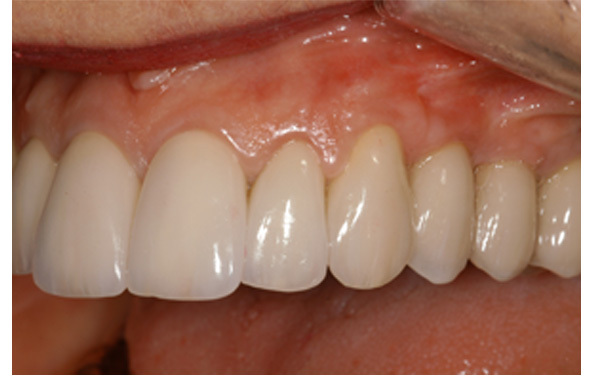 After the implant surgery healed, a porcelain restoration completed the beautiful smile this patient never had. 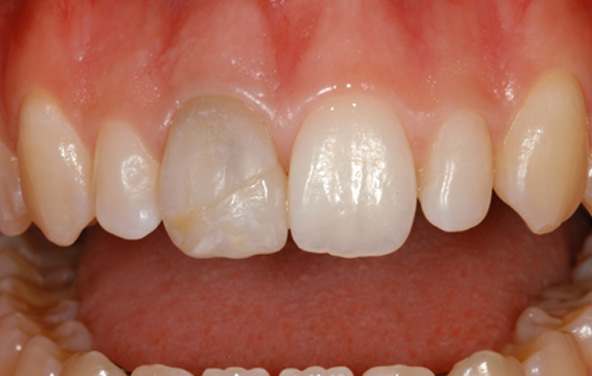 This patient suddenly developed an abscess after a root canal failed on her front tooth. She was mortified at the thought of losing this tooth and was concerned about how to manage the problem, since she came to our office all the way from Wyoming. She was amazed and relieved that we were able to extract her hopeless tooth, remove the infection, place the implant, and graft the missing bone all in one appointment. We fabricated a temporary appliance that she wore for five months before returning for her permanent crown construction. Her new implant crown looks like nothing happened. 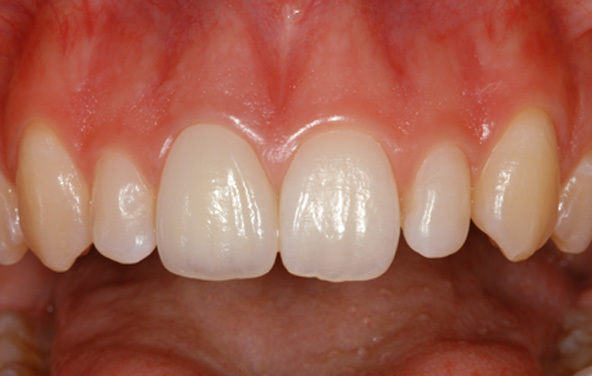 This patient had an existing three-tooth bridge that extended from bicuspid to molar. 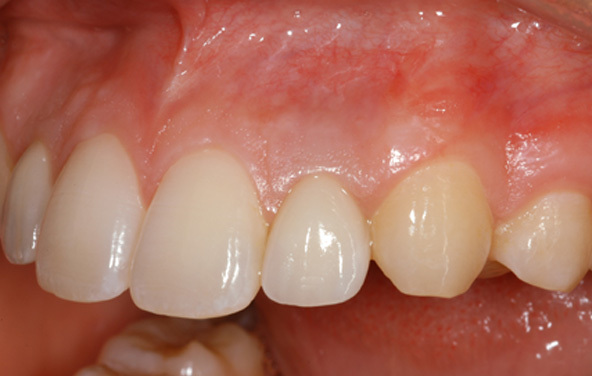 The front support for the bridge (the bicuspid) had become abscessed and required extraction. 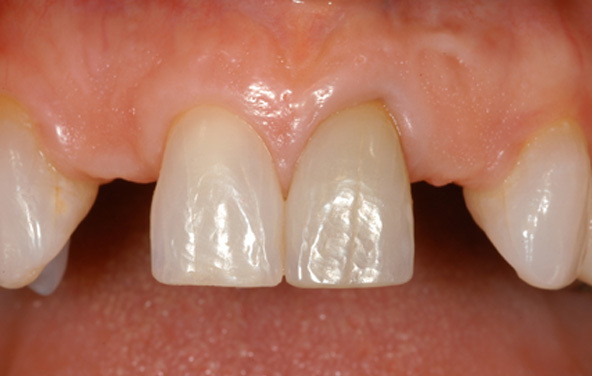 Our patient initially requested a new (now longer) bridge. But a longer bridge is weaker, and since this patient has a clenching habit, we felt that it would not last. Dental implants would be a better choice. The patient took our advice. 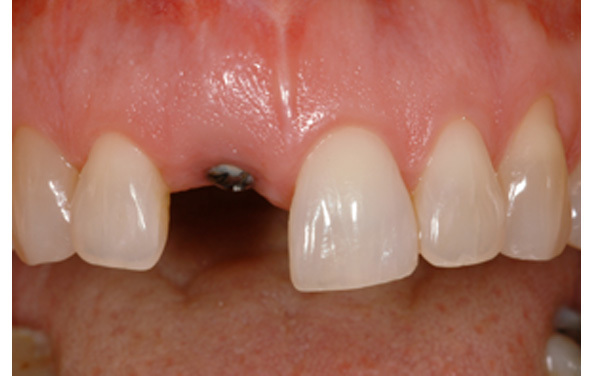 Two implants replaced the missing teeth. Then, crowns were used to restore her smile and bite. 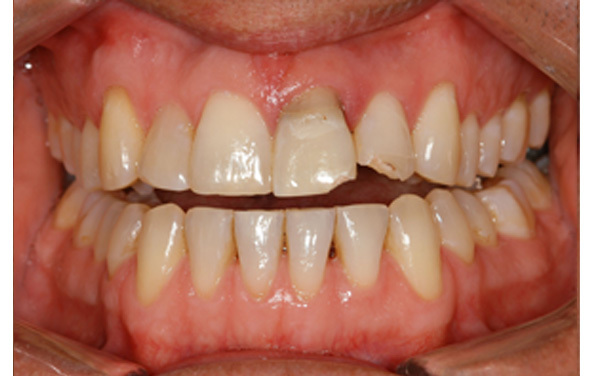 This solution has proven to be very strong, and our patient is happy she decided to improve her bite and smile, both of which are now much more attractive. This patient lost his tooth in an unfortunate industrial accident. 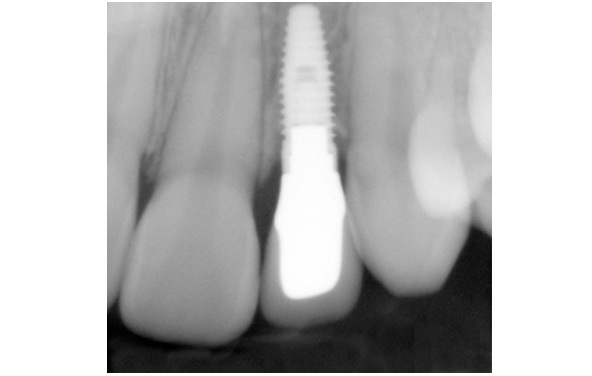 The implant was placed by another clinician before referral to our office, for fabrication and placement of the abutment and crown. He was absolutely thrilled with this gorgeous result. 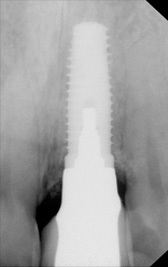 A custom fabricated zirconium abutment was attached to the implant using a gold screw (see x-ray). 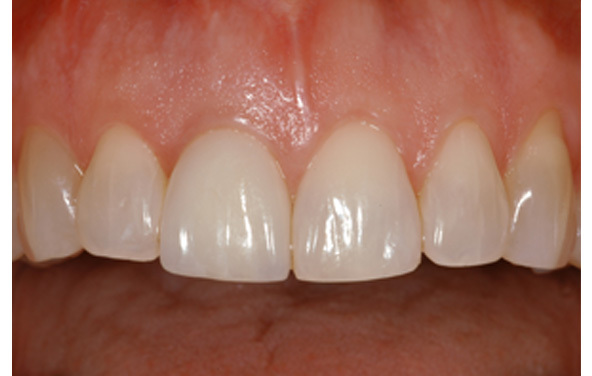 Porcelain restorations (a crown and veneer) were then cemented to the implant abutment and the adjacent natural tooth. This patient was excited to be moving his family into a new house. On moving day, however, he tripped on the stairs and fractured two front teeth. He came to our office panicked. The front tooth was fractured under the bone and was hopeless, requiring extraction. 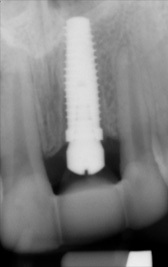 We placed a dental implant immediately after the extraction. When possible, this sequencing makes the healing much easier and faster than when done in different appointments. 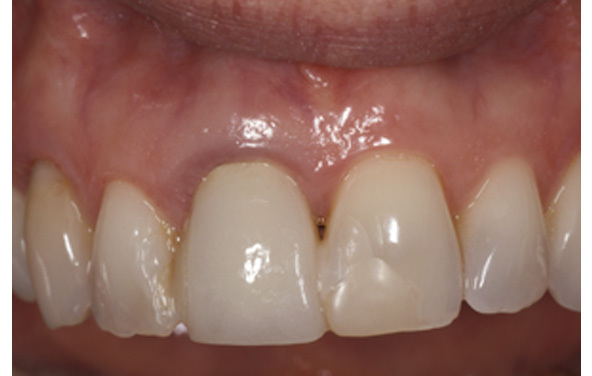 Our patient was thrilled that the crown portion of his extracted tooth could be bonded to the adjacent teeth to serve as a temporary while the implant healed. Later, a porcelain crown was fabricated to fit the implant, and composite was used to repair the chip on the adjacent tooth. Our patient was amazed with his result and the simplicity of the procedure. 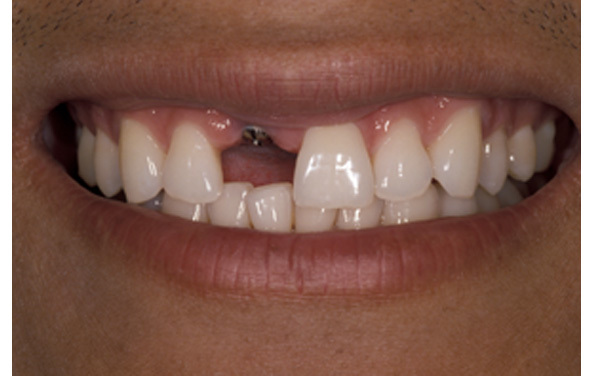 Titanium implants replaced the missing teeth, and porcelain crowns were used to reconstruct his bite and function. The result was so striking, he wished he had done this sooner.